Sometimes we need to add scroll bar to a div or span whenever text in the div or span get overflow. 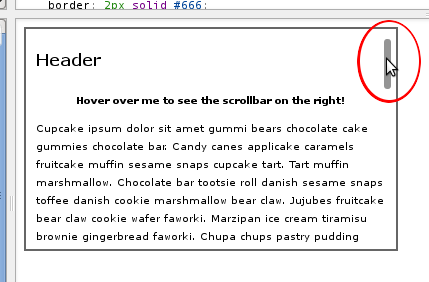 scroll bar is supported in all browsers like IE 5+, FF 3.5+, and Safari, Opera etc. To show scroll bar, we need to specify overflow property of css to "visible" or "auto". 1. To show scroll bar always set overflow to "visible". It will show scroll bar whether text get overflow or not. 2. To show scroll bar only, when text get overflowed, set overflow property to "auto". Scroll bars do NOT show scroll bars using chrome from Android device (via Chrome) using overflow-y: visible; when I try it.